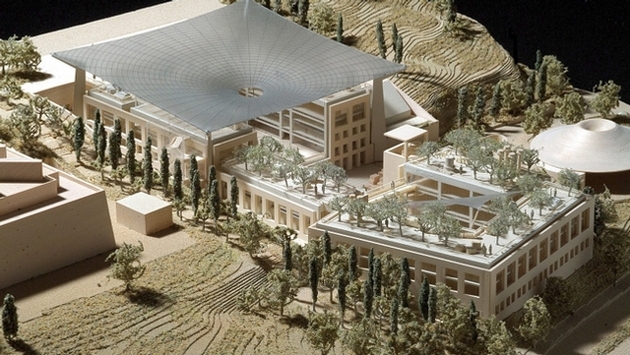 The Israel Antiquities Authority has announced that it will unveil the all-new, state-of-the-art Schottenstein National Campus for the Archeology of Israel in Jerusalem, the largest archeological library in the Middle East, in April 2016. Located on Jerusalem's Museum Hill adjacent to the Israel Museum and overlooking the Hebrew University - Givat Ram Campus, the new 115,000-square-foot archeology campus was designed by renowned Israeli architect Moshe Safdie, and will house nearly two million archeological artifacts (including 15,000 Dead Sea scrolls), conservation and restoration laboratories, an auditorium, study galleries, rooftop exhibition gardens and a café. The campus will also house the Mandel National Library for the Archeology of Israel, which will feature nearly 150,000 volumes, including rare books and periodicals, as well as the Israel Antiquities Authority Archive, the British Mandatory Archive and historical maps, permits, plans and publications of excavations from the period of the British Mandate over Palestine through today. "We are proud to announce the construction of this stunning, state-of-the-art center for archeology in my hometown in Jerusalem," said Haim Gutin, Israel Commissioner for Tourism, North and South America, "which will further promote Israel as one of the world's most unique travel destinations for archeology enthusiasts." For more information about the new archeology campus, visit www.antiquities.org.il/iaa_home_eng.asp. For more information about travel to Israel, visit www.goisrael.com.